Just the thought is scary… but I’m talking about the popular show Unwrapped on the Food Network. 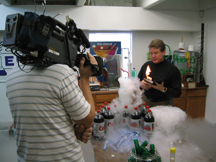 Producers from the show called to see if they could get a better look at the science behind the Mentos Geyser Experiment and to see if they could get a sneak peek at our new line of Geyser Tube toys. Not only did they get an up close view of the spewing soda geyser, the crew learned how to cook with 20 liters of liquid nitrogen. I forgot to mention to the photographer, Andy McDonald, that he and his expensive HD camera would disappear in a giant cloud of smoke when I poured out the liquid nitrogen. The good news is that no one died when we wrapped up the day with a round of exploding, self-carving pumpkins.